Taste what you love about pizza in a dip with our Layered Pizza Dip recipe! 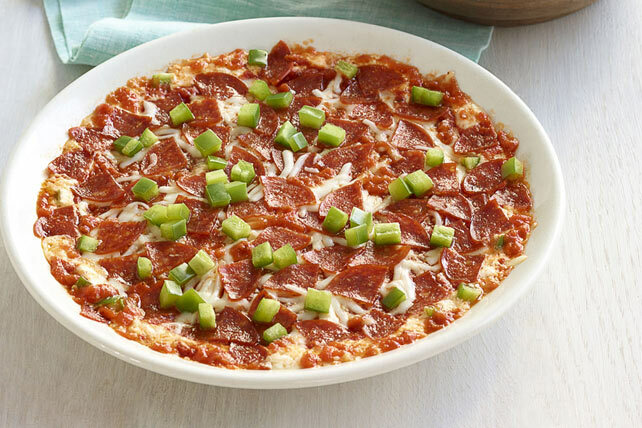 From the sauce to the cheese and pepperoni, you'll love this pizza dip recipe. Mix cream cheese spread, dressing, sour cream, 1/2 cup mozzarella and 2 Tbsp. Parmesan until blended; spread onto bottom of microwaveable 9-inch pie plate. Cover with pizza sauce, remaining cheeses, pepperoni and peppers. Microwave on HIGH 4 to 5 min. or until dip is heated through and mozzarella is melted. Serve with toasted baguette slices or green pepper chunks. Assemble dip in 9-inch pie plate. Bake in 350ºF oven 15 to 20 min. or until dip is heated through and mozzarella is melted.